As a frustrated artist-wannabe, I am always intrigued by projects that work to visually explain, connect, explore and/or organize complex relationships between people/events/news/insert your item here. Seeing that kind of work online always inspires me and reminds me of the techy-feely relationship we all have with our arts (digital or not). One of my favorites was the Music Genome project, which had a great map linking artists together so you could follow paths from artist to artist and see if Prince really is related to John Denver. That has since morphed somewhat into Pandora. 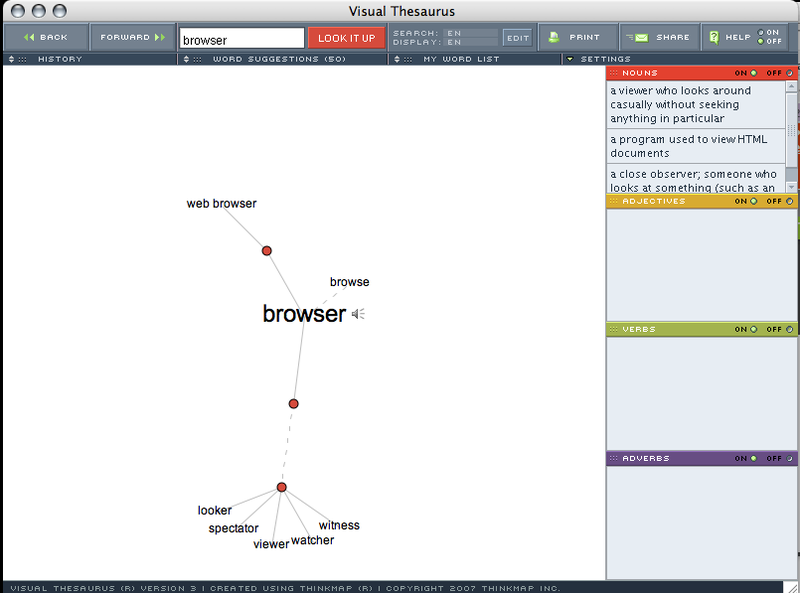 Then, I saw a link to the Visual Thesaurus, which is a really great way to get out of writer’s block, create fresh copy or build your vocabulary. But, it has a cost! Poop. For even more, check out the visualcomplexity site for more projects exploring ways to map complex networks.